Desiderius Erasmus. Adagia. Venice: Aldine Press, 1520. Title page, bearing the Aldine anchor-and-dolphin device. UCLA began collecting these treasures of Renaissance printing in 1961, when the Library bought 45 Aldines from the library of San Francisco collector Templeton Crocker, whose grandfather, Charles Crocker, was one of the “big four” who built the Central Pacific Railroad. Over the years, the collection, with ongoing support from the Ahmanson Foundation, grew steadily into one of the world’s premier Aldine collections, and now includes more than 1000 imprints. 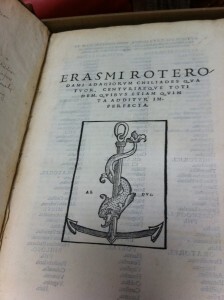 The collection provides rich research material for scholars studying the printing history and operations of an important Renaissance press, the new Aldine typefaces and formats, and the way these innovations influenced readership, education, and material culture, and inspired an industry of counterfeit publishing in the process. 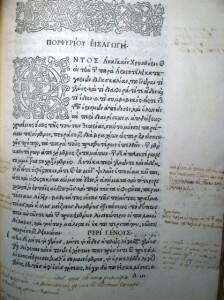 Among the many treasures of the collection are Aldus’s monumental Greek editions of classical texts, printed in several Greek typefaces he designed: the works of Aristotle in 1495--the first printing of a major Greek text in its original language; Theocritus in 1496, Aristophanes on 1498, Herodotus in 1502, Homer in 1504, and Plato in 1513, to name just a few. Perhaps Aldus’s greatest achievement was his introduction of the octavo, a small, light, and portable book format which allowed readers to carry their books with them, and made good literature accessible to the masses. The UCLA collection includes such gems as Aldus’s 1501 Virgil, the first portable book he printed, as well as the first to be printed in his new italic type, based on humanistic manuscripts of the age; Petrarch’s Le cose volgari, from the same year, the first book printed in italic type in a vernacular language, and the first edition of Petrarch in the new small format; and a 1502 edition of Sophocles, the first of the Greek classical texts to be issued in the small format. 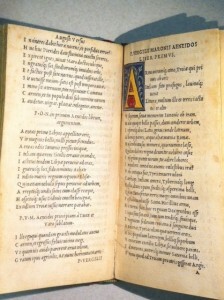 Although Aldines not already in UCLA’s collection rarely come on the market, the Library was recently able to fill a gap when it had the good fortune to acquire Erasmus’s Adagia, a volume of Latin and Greek proverbs, printed at the Aldine Press in September of 1520. This copy once belonged to Jean Grolier (1479-1565), French statesman, fine binding aficionado, and early collector of Aldines. 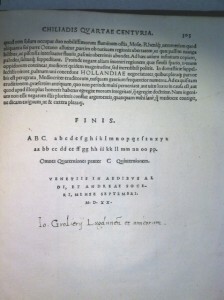 Ownership inscription of Jean Grolier of Lyon “and friends” below colophon of the 1520 Adagia.